Wales’s Health Minister has hailed a care organisation for the “high standards” of infection control resulting from a new staff training programme. The praise from Professor Mark Drakeford AM came during a whistle-stop visit to see the facilities at the £4 million Bodlondeb Centre, a centre of excellence for dementia care at Pendine Park. Apart from being shown its wide range of facilities and meeting residents, their relatives and senior managers, he found time in a busy schedule to present awards to three members of staff who have just successfully completed the centre’s new infection control training programme. Bodlondeb manager Ann Chapman said: “As part of our on the job learning programme each member of staff completes an infection control `toolkit`. The booklet contains a series of questions about the kind of infections which they might come across in the course of their duties and the methods by which these can be combated. “Staff members who score the highest marks in demonstrating best practice are then selected to receive one of our Semmelweiss Awards. “These awards are inspired by and named after Ignaz Phillip Semmelweis, a Hungarian physician of German extraction who is known as an early pioneer of antiseptic procedures. Receiving the awards, consisting of an inscribed plaque and certificate, were care practitioners Katy Topham, 23, from Rhostyllen, who has worked at the centre for just over two years, and 23-year-old James Bowen from Penycae who has been at Bodlondeb for four years, along with Beth Mullock, 48, from Summerhill, Wrexham, from the administration department, who has been on the staff for over 16 years. Mr Drakeford warmly congratulated and shook hands with each of them as he handed over their awards. And he said: “Understanding and putting infection control into everyday practice is a vital part of care whatever area of health or social care people work in. Bodlondeb is thoughtfully designed around safe central gardens, in a tranquil setting surrounded by gardens and countryside. Each eight-bed unit is individually staffed enabling the centre to focus on a wide range of dementia and mental health needs, including functional, organic and affective disorders. With lounges in each unit for relaxation, stimulation and communal living, Bodlondeb prides itself on having a true family feel. Heavy emphasis is also placed on music and art therapy for residents, with staff leading frequent sing-alongs for residents and weekly creative classes being run by artist in residence Sarah Edwards. 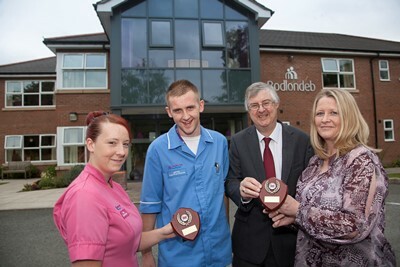 Bodlondeb was officially opened by Wales’s First Minister Carwyn Jones in November 2010 when he hailed the facility as a “pioneering model of care”. The visit was organised after the Health Minister asked Pendine Park proprietor Mario Kreft if he could come to see what they did. Greeted on his arrival by Mr Kreft and his wife, Gill, along with a group of senior managers from Bodlondeb and other care homes in the award-winning Pendine group, the Minister was given a comprehensive guided tour of the centre, visiting a number of the spacious residents’ lounges and accommodation. Facilities and services available were pointed out by Bodlondeb Manager Ann Chapman who led Mr Drakeford into one of the lounges where a group of residents were singing along to a selection of Abba songs being strummed on a guitar by two staff members. After being shown the artwork of other residents by artist in residence Sarah Edwards, the Minister was delighted when he was presented with a framed painting of daffodils by resident Elaine Edwards. Next stop was an enclosed garden leading off the lounge where Mr Drakeford became acquainted with resident cockerels Donald and Blackie. Manager Ann Chapman explained to him that the birds had become a vital part of the team as their presence had a relaxing effect on both residents and visiting relatives. Before leaving, Mr Drakeford stopped to talk to a number of people who were just arriving to visit relatives at the centre. The Minister said: “I have really enjoyed coming here this morning, and I’ve learned an awful lot in a short period of time. “It’s been great for me to meet the relatives of people who are here who tell them they have travelled a long distance to come here today. “But they said they were happy to do that because they know this is the right place for their relatives and it gives them peace of mind to do that, so meeting them, meeting staff and seeing the great range of things that are going on here has been great. Bodlondeb proprietor Mario Kreft said: “We were delighted that the Minister could come and see the innovative work that we’re doing here in the Pendine organisation and particularly happy that we were able to show him our new infection control training programme for staff and enrichment package for residents. “It’s all about ensuring that people can have their lives enriched and every little thing we can do for them, like our music and like our arts programme, makes such a difference in a very personal way. “Through our new training package we try to make our staff understand they are to making people’s lives enriched and enjoyable – and how little things matter.